There are few things that speak to our ancient selves like the Axe. Just the word axe triggers a response deep within and brings to the surface images of buckskin clad frontiersman carving their way through the forested wilderness. 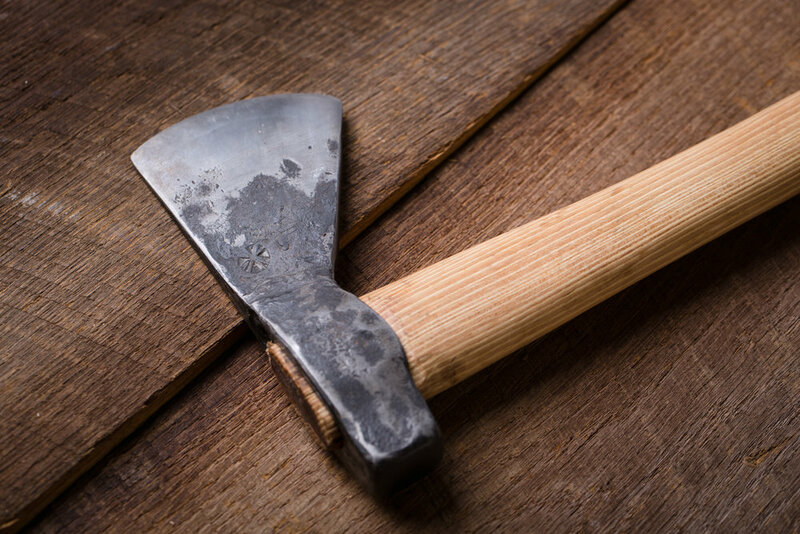 The axe was assuredly one of the first tools humans created. First as a stone held in the hand, then hafted with wood and rawhide. Later they would be cast from bronze, and finally forged from iron. With this one tool a human being could create shelter, harvest wood for the fire, and carve everything from bows for hunting to spoons for eating. To me the Axe is the ultimate symbol of human ingenuity, determination, and freedom. My axes are forged in the fire, one at a time. I punch the eye, drift it with a mandrel, and hammer out the “ears”. Then I hammer the blade to shape. If it is of iron I then split the blade to accept a bit of high carbon steel. This is forge welded in place and guarantees that it will hold a good edge. If I am forging an axe from recycled carbon steel this step is unnecessary. Once it is forged I take it to the belt sander, clean it up, temper it, and haft it with a locally harvested hickory handle. It is then fitted with a vegetable tanned leather mask. This axe is the perfect companion for a tramp in the woods or to keep in the wood box next to the hearth. The head itself weighs 2 lbs and measures 6” long with a 3” cutting edge. With an overall length of 20” this axe is big enough to swing two handed but light enough to use one handed for finer cutting. Small enough to strap to your pack or carry on your belt yet big enough to fell a tree 6” to 10” in diameter. The only axe you need to chop firewood, split kindling, and carve a spoon as you sit around the evening fire! There are few men that spent more time using an axe than Horace Kephart. As he tramped and travelled through these mountains that I call home an axe was a daily part of his life. This axe is forged from repurposed “flea market” steel such as old pry bars. It is made to the specifications Kephart put forth himself, a weight of 8 oz., 2 1/2” edge, with a haft of locally harvested hickory. Handy for a myriad of camp choresand light enough to throw in your pack and forget about it til it’s needed!